When I wrote "The Spines of the Mahabharata Books" in Feb 2013, only the first six volumes of Dr. Bibek Debroy's unabridged translation of the Critical Edition of the Mahabharata had been published. The seventh volume (my review) was published in June 2013, while the eighth (my review) was published in late November 2013 - this one was somewhat delayed because of issues with getting the binding right I believe. So I thought it was time to update my post, actually write a new one, covering the spines of these two volumes. The ninth and tenth are going to be published in November 2014, so there is some time to go before that event. As I had written, each volume of the series contains a motif that is associated with the content in the volume. 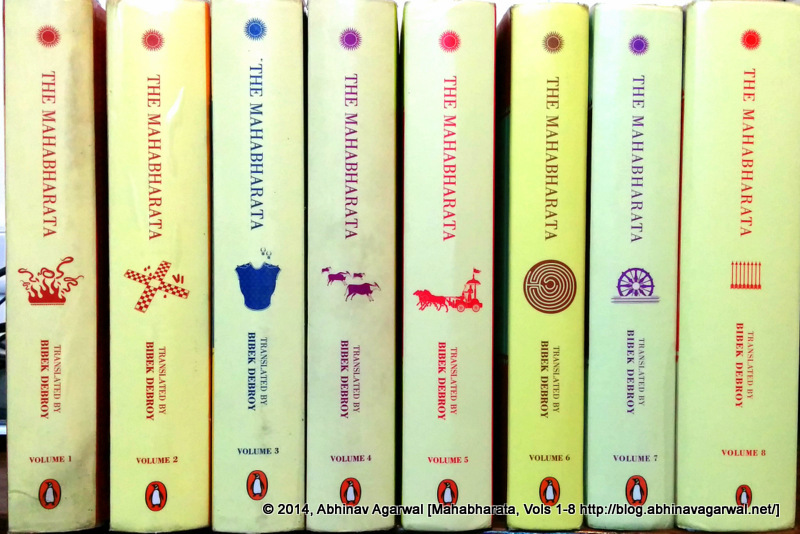 You can read my earlier post, "The Spines of the Mahabharata Books", for a description of the spines of the first six volumes. As you may recall, especially if you read my reviews, the seventh volume marked the end of the Mahabharata war, with Karna killed on the seventeenth day on the battlefield of Kurukshetra, beheaded by an arrow shot by Arjuna at an unarmed Karna who had got down from his chariot to extricate its wheel that had been mired in mud. Hence the spine of the seventh volume has an illustration of a wheel partially submerged in mud. Given the inclination to avoid persons on the spines, the fifth volume was the sole exception, Duryodhana's battle with Bhima was therefore not a candidate. Each passing day brings into the headlines another sordid story of a child being abused somewhere in the country. After the initial scandal and outrage, the media scatters to find its next new titillating tale to expose, the public finds distraction in the latest sporting tamasha – consoling itself that such things could not possibly happen to people like them, self-proclaimed experts crawl out of their holes to appear on television debates and blame everything on the wanton promiscuity of the west or the patriarchal oppressiveness of the Hindu society – depending on which deep end of the ideological spectrum they have gone over, while the family of the victim is left to pick up the scraps of normalcy in their lives even as they deal with the subsequent abuse of their humanity at the hands of the police and judiciary.